When you select any of our Start ‘N’ Go + products, you will receive a personal VIP treatment every step of the way. Your product will be picked, fully assembled and set-up and when it is ready one of our specialist delivery drivers will contact you to arrange a delivery day and time that is convenient to you. Find out more. FREE DELIVERY - START 'N' GO+Qualify for Start N Go + delivery? The Stiga Park 740 PWX is a 50:50 articulated machine, where the rear wheels exactly follow the front wheel tracks. Provided with 4WD for perfect traction on slopes, hydraulic power steering that provides superb manoeuvrability, and pedal-controlled hydrostatic transmission powered by a Briggs & Stratton Vanguard 18 Twin Cylinder 570cc engine. This offer includes a 110cm Combi Pro EL Quick Flip cutting deck. The Park 740 PWX 4WD is powered by a Briggs & Stratton Twin Cylinder Vanguard 18 engine with a displacement of 570cc and a power output of 11.9kW @ 3200rpm. The Pro Electric 110cm Quick Flip deck, with 'height of cut' adjustment from 25 to 90mm, is fitted to this machine and the settings can be adjusted without leaving the seat. Hydrostatic 4WD transmission means that you have infinite speed control in either direction from a single pedal. The PTO clutch is manually controlled from the seat and the fuel tank capacity is 12 litres. Imagine driving around your garden effortlessly creating a perfectly clipped healthy green lawn, no longer restricted to driving up and down in straight lines, scuffing the ground turning on the same areas and wasting fuel and time collecting grass clippings that will sit in an unsightly rotting pile at the bottom of your garden. Imagine easily coping with soft wet ground conditions on a flat or sloping garden, manoeuvring quickly around all sorts of obstacles without worrying about your rear wheels dropping of the edge off the lawn or catching the back of your tractor on fences, trees or even your new greenhouse. Imagine being able to trim under overhanging shrubs and into corners because your Multiclip cutting deck is positioned at the front of the machine where you can always clearly see it and it cuts the grass before your wheels have a chance to lay it flat. Only a 4WD Stiga Park can provide you with such an enjoyable way to maintain and improve your lawn and paddock areas, turning this chore into a ‘Drive in the Park’. Stiga’s unique articulated chassis design ensures that the rear wheels follow exactly in the path of the front cutter deck. This is made possible because the chassis pivots at the centre point of the front and rear axles leaving you free to concentrate on looking forward at the grass that you’re about to cut rather than worrying about the obstacles that you have just passed. The articulated chassis design also means that the simple and effective 4WD system eliminates any tyre scuffing on your lawn whilst turning, as well as ensuring excellent traction in wet conditions and on sloping ground. The first thing that you should consider when selecting the correct 4WD Stiga Park for your needs is the type of cutting deck you require and this will determine the minimum power requirement for your particular machine; if you are concerned about access through gateways or narrow paths then add 10cm to the cutting width of the deck, this will be enough to allow you to drive your machine through the gap easily. All Stiga Parks are designed with functionality, reliability, comfort, quality and the environment in mind. At Just Lawnmowers we have again raised the bar in supplying garden tractors online, but guaranteeing a personal face to face delivery service. A garden tractor is an expensive purchase and requires a professional hand over to eliminate unsafe operation and dangerous misuse. With our Start ‘N’ Go Plus products, you will receive personnel VIP treatment every step of the way. Your product will be picked - fully assembled and set-up - one of our specialist delivery drivers will contact you to arrange a delivery time that is convenient for you. On arrival our driver will talk you through the safe operation of the whole machine, along with advice on, basic maintenance, storage and suitability. They will require you to test drive your new product on your lawn to see you are confident with the operation and to answer any questions you may have. They also want it delivered on a day (and at a time) to suit them. What is Start 'N' Go+? This "white glove" service has been introduced as we feel there may be a requirement that a customer requires more than just the product delivered in a box where DIY assembly is required... and ever more than our very successful Start & Go service where the products is assembled and ready to use, but would still require the removal of the product off the pallet and to study the owners manual before use. If this is you or wish to purchase a product for a loved one, Start & Go + is the service for you. When you select any of our Start ‘N’ Go Plus products, you will receive a personal VIP treatment every step of the way. Your product will be picked, fully assembled and set-up and when it is ready one of our specialist delivery drivers will contact you to arrange a delivery day and time that is convenient to you. On arrival our driver will talk you through the safe operation of the whole machine, along with advice on, basic maintenance, storage and using the machine. They will require you to test drive your new product on your lawn to see you are 100% happy with the operation and to answer any questions you may have. PLEASE NOTE: This service is only available in selected postcodes, so please check before you select this service. Please note: Delivery is 5-7 working days for all Start N Go + products as your machine will need to be assembled and tested before delivery. Stiga have been associated with garden machinery for well over 80 years. In March 1934, Sweden, Stig Hjelmquist started the company ‘Firma Fabriksprodukter’ which became the foundation of Stiga AB. The original business concept was ‘newsworthy products of good design and good quality, with advertising that is better than our competitors.’ This business concept was designed to permeate through the whole of Stig Hjelmquist’s business life. In 1938 the company name was changed to Stiga and the very first Stiga table tennis products were produced. In 1943 Stiga were producing table tennis equipment under their own management, but a few years later they began cooperating with the Swedish TableTennis Association. In 1954 Stig Hjelmquist imported the first motorized lawn mowers with horizontally rotating blades from the US. That became the starting point of Stigas most successful line; garden machinery. Over the next few years Stiga continued to work on their table tennis line and produced the first table hockey game. But in 1964 they began their own line of lawnmowers which was incredibly successful. Roughly 400 machines were produced every day. By 1976 Stiga’s new factory was a massive 34,000m2 making it the biggest factory in the Nordic countries producing motor driven lawnmowers. Stiga became the biggest manufacturer of lawn mowers in Europe by 1986. They introduced the first mower with the Multi-clip technology, and the first radio controlled mower. By 1997, Stiga were represented in roughly 40 countries, including New Zealand, North America, South America and Eastern Europe. 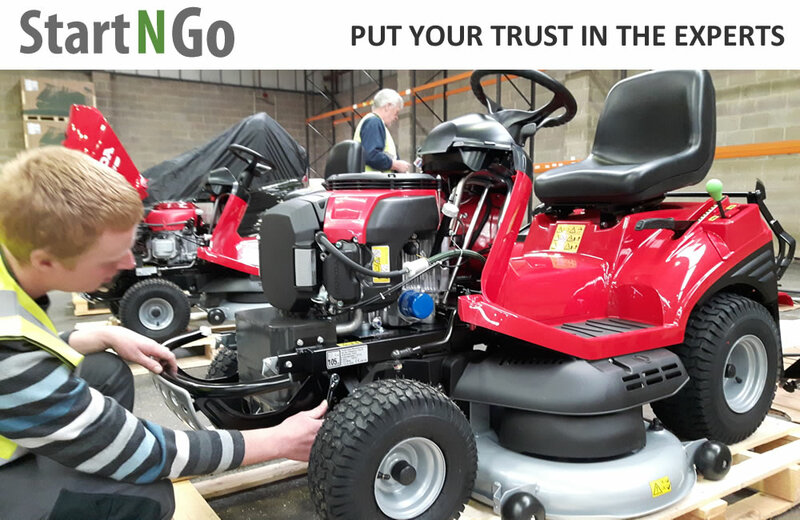 Now, Stiga are owned by the GGP Group, manufacturer of one of the largest range of lawn mowers and garden machinery in Europe. GGP UK Limited distribute all Stiga garden machinery in the UK. The quality of Stiga’s machines is second to none. The lawn mowers are built to get the job done efficiently and safely with no fuss and no time wasting. They feature powerful Stiga engines or other well known top brands such as Briggs and Stratton or Honda. The range includes hand pushed models and self propelled machines to choose from. Stiga also offer a very innovative range of front deck mowers. They’re built for accurate mowing and getting into areas which are often harder to reach. Several of the Stiga models in the ride on range have even been awarded the Red Dot Design Award 2013. The Stiga compact lawn riders are really easy to use, offering great manoeuvrability and forward visibility and the Stiga garden tractors are packed with high performance features. The Stiga range of brushcutters, hedge trimmers and tillers are all of the same fine excellence that the lawnmowers and ride ons have.